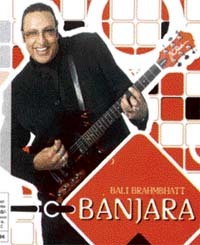 ABOUT a decade back, Bali Brahmbhatt had a good run with his Hindi rap. The "Amma dekh, tera munda bigra jaye" singer from Nairobi was expected to go places but the script went wrong somewhere on the way. The man who lent his voice to many films and also cut 14 albums disappeared for all practical purposes. Well, these things do happen in cinebiz. What matters is that he is now back with a new album, which shows that he has not really dated during this hibernation. He presents a medley of songs which make an eclectic mix and may help him relive his old glorious days. What has helped him in this venture is the fact that he can speak Hindi, English, Gujarati and Punjabi like a native. Here, most of the songs are in the first two languages and fairly hummable. You can notice traces of rap, bhangra and garba in the music composed by Manish Sinha and Brahmbhatt himself. The Hindi lyrics are by Ravi Chopra and the English ones by Clyde Paiva. The title song is there in both languages. It also happens to have a "trance mix", making it three versions in all. Similarly, Tum yaad aate ho and Kuchh baat hai become Baby I just think of you and Something when they are sung in English. Kenya-born Brahmbhatt is a consummate stage performer who has vowed audiences from the Far East to the West. Nearly all the songs included in the album seem to be tailored to suit the tastes of live audiences. THERE are some instances of films having not one but two music directors. This one goes a step further. There are as many as three music directors. No, they are not collaborating like Shankar, Ehsaan and Loy. They have contributed different songs to the film. Add to that two remix songs by Eric Pillai, and you have four names to contend with. The single-song director is Pritam with Hai Ishq ye kya ek khata sung by Sunidhi Chauhan and K.K. Twice as many – that mean two – have been contributed by Mithoon. These are Tere bin sung by Atif Aslam and the title number rendered by KK and Dominique Cerejo. The top scorer is Vivek Philip with the honour of contributing full three songs: Zindgai hosh mein (KK and Zubeen Garg), Ashq bhi (Sunidhi Chauhan and KK) and Dheemey dheemey (Sunidhi Chauhan and KK). Whatever may be your general opinion about this trend you cannot accuse the film of being short on variety. Variation adds flavour to the score. Dheemey dheemey is made superior by the voice of Sunidhi Chauhan.